A-HOTEL.com - Luxury and cheap accommodation in Stavrovo, Russia. Prices and hotel, apartment booking in Stavrovo and surrounding. Трактир Граф Суворов is offering accommodation in Lakinsk. Boasting a 24-hour front desk, this property also provides guests with a restaurant. Offering an outdoor swimming pool and a sauna, Rublevskie Zori is located in natural surroundings in Koloksha Village. It features a garden with barbecue facilities and bike rental. Featuring a bar, Traktir Iamshchik Bed & Breakfast is conveniently located in Leninsky district of Vladimir, 11 km from Nativity Convent. This property is 11 km from Assumption Cathedral. 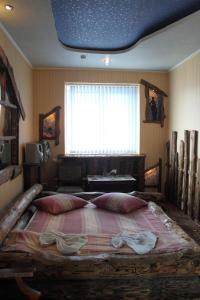 Holiday Home na Prohladnoy offers accommodation in Vladimir, 9 km from Vladimir city centre. It provides free private parking. This hotel is located in Yuryevets District of Vladimir, 10 km from the town centre. Rustic-style rooms and a garden are featured at Yamskaya Zastava Hotel. Уютная квартира в новом доме is an accommodation located in Vladimir, 10 km from Nativity Convent and 10 km from Assumption Cathedral. The property has city views and is 10 km from Palaty Museum and 9 km from Golden Gates. Located in Vladimir, 42 km from Suzdal, Zhemchuzhina Zolotogo Koltsa features a barbecue and a private beach area. There is a games room on site and guests can enjoy the on-site bar. Sanatoriy Russkiy Les is offering accommodation in Sobinka. Featuring a tour desk, this property also provides guests with a children's playground. Set in Bogoslovo in the Vladimir region, Экопарк Богослово provides accommodation with free WiFi. The accommodation has a sauna. This hotel in Vladimir is just 5 km from Vladimir city centre. It has a sauna with an indoor pool and billiards and meeting facilities. Semyazino Inn is located in a quiet area of Vladimir, close to lake Semyazino, 6 km from the city centre. Free WiFi access is available. Апартаменты на Нижней Дуброве / 2pillows is set in Vladimir, 7 km from Nativity Convent, 8 km from Assumption Cathedral, as well as 8 km from Palaty Museum. Guests staying at this apartment have access to a balcony. Situated 6 km from Nativity Convent, 7 km from Assumption Cathedral and 7 km from Palaty Museum, 1-комн. квартира features accommodation set in Vladimir. Boasting accommodation with a balcony, Apartment on Verkhnyaya Dubrova is set in Vladimir. The property is 5 km from Nativity Convent. Situated in the Leninsky district in Vladimir, 6 km from Nativity Convent and 6 km from Assumption Cathedral, Apartment on Lakina proezd 4 features an equipped accommodation with a balcony and free WiFi. Guests staying at this apartment have access to a fully equipped kitchen. Set 6 km from Nativity Convent in Vladimir, Hotel Ставровская 1 offers accommodation with a kitchen. The accommodation features free WiFi. 8 проезд Лакина enjoys a location in Vladimir, just 5 km from Nativity Convent and 6 km from Assumption Cathedral. The property is 6 km from Palaty Museum and 3.
апартаменты на дуброве is situated in Vladimir. The apartment is 6 km from Nativity Convent. Set 5 km from Nativity Convent in Vladimir, Apartment on Stavrovskaya 1 offers accommodation with a kitchen. This apartment also has free WiFi. 5 km from Nativity Convent, Apartment on Verhnyaya Dubrova 5 is located in the Leninsky district of Vladimir. The property is 6 km from Assumption Cathedral.